Take Interstate 80 East toward Sacramento to Interstate 505 North. Travel on Int. 505 North for about 13 miles to Exit 11 - Winters CA128 West. Exit to the right. Go three blocks to 308 Railroad Avenue. 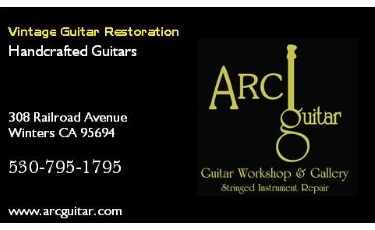 ARC Guitar is on the right side, next to Turkovich Winery and the Putah Creek Cafe. Make left turn at signal light. Go over 505 overpass toward Winters. CA128 West becomes Grant Avenue. ARC Guitar is on the right side, next to Turkovich Wines and the Putah Creek Cafe.